AVR-S710W is rated 4.5 out of 5 by 2. Break the sonic boundaries with the AVR-S710W 7.2 channel A/V receiver which features Dolby Atmos immersive surround decoding, delivering breathtaking surround sound with today's advanced movie soundtracks. With Dolby Atmos you'll experience the same revolutionary 3D surround sound found in premium movie theaters, with the ability to create an overhead surround soundfield that dramatically expands the sonic space. And, via a future firmware update, the AVR-S710W will be able to decode DTS:X soundtracks, which also deliver an immersive 3-dimensional soundspace. Prepared for the future, the AVR-S710W features an advanced video processing and signal handling system, including the latest HDMI 2.0a specification which provides for 4K Ultra HD full rate 60 Hz content, 4:4:4 Pure Color sub-sampling and 21:9 aspect ratio pass-through. It's also HDCP 2.2 compliant, which is a requirement for 4K Ultra HD copy-protected content. Full wireless connectivity is provided by both Wi-Fi and Bluetooth, with dual antennas that deliver robust signal transmission and reception. Stream your favorite audio tracks wirelessly to the AVR-S710W, and enjoy easy control via our available iOS, Android and Kindle apps. For decades, movie surround soundtracks have been channel-based. Dolby's revolutionary Atmos surround sound technology dispenses with channel-based coding in favor of more advanced object-based coding, giving the sound designer the ability to precisely place sounds anywhere in the 3-dimensional space. Now, you can enjoy this same award-winning technology at home with the AVR-S710W, which features the ability to connect a 5.1 surround sound speaker system and 2 additional overhead speakers or 2 additional Dolby Atmos-certified up-firing speakers for the ultimate home theater experience. Along with Dolby Atmos decoding, the AVR-S710W also features Dolby TrueHD lossless decoding and other Dolby Digital technologies. The latest immersive surround sound system, DTS:X features object-based audio coding that lets the sound designer place sonic elements anywhere in the 3D acoustic soundspace, and provides for overhead speakers to deliver a stunning surround sound experience. Along with DTS:X decoding, the AVR-S710W features DTS-HD Master Audio decoding and other DTS audio technologies. Featuring an advanced quad-core 32-bit DSP processor, the AVR-S710W easily handles multi-thread processing tasks, including Dolby Atmos and DTS:X decoding, Audyssey room acoustic correction, bass management and DSP surround simulation. The processor features tremendous processing power, with 4 300-MHz DSP cores that deliver over 1 billion computations per second. Featuring 6 HDMI inputs, including 1 conveniently located on the front panel, the AVR-S710W incorporates an advanced video section that features the latest HDMI 2.0a specifications, including support for 4K Ultra HD 60 Hz full rate video, 4:4:4 Pure Color sub-sampling and 21:9 video pass-through, along with support for 3D content. The AVR-S710W also features HDCP 2.2 compatibility, a requirement for 4K Ultra HD copy-protected content. Featuring Bluetooth & Wi-Fi wireless streaming connectivity, the AVR-S710W is equipped with an advanced dual antenna RF transceiver system, for robust and error-free streaming even in congested urban environments. Connect to the internet through your home Wi-Fi network (or with a hard-wired connection via the RJ-45 Ethernet LAN port) and enjoy your favorite tracks from streaming music services such as Pandora, Spotify Connect and Sirius XM. You can also choose from thousands of internet radio stations around the world, and enjoy music from virtually every genre. With AirPlay, you can enjoy listing to your favorite tracks wirelessly from your favorite iOS device, including the iPod touch, iPhone and iPad, and the AVR-S710W is also DLNA 1.5 certified for compatibility with your home PC or Mac. 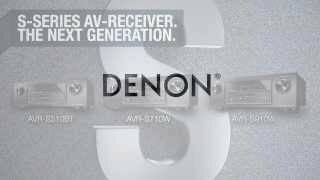 Our Denon Remote App lets you easily control the AVR-S710W with your favorite portable device, and is available for Apple and Android devices as well as the Kindle Fire. In addition to handling 4K Ultra HD 3840 x 2160 resolution, the AVR-S710W also features HDR (High Dynamic Range) and Wide Color Gamut compatibility, key components of the BT.2020 4K Ultra HD video specification. Featuring high current discrete power output devices, the AVR-S710W delivers high power and is rated at a maximum of 165 watts per channel. There's also an Auto Eco mode that adjusts the maximum power available according to the volume level, as well as an on-screen Eco meter that lets you see the power consumption reduction in real time. For compatibility with the widest range of loudspeaker models, the AVR-S710W is also equipped with low impedance drive capability, to provide operational stability with speakers rated at 4 ohms. The AVR-S710W features dual subwoofer outputs, which lets you connect two smaller subwoofers instead of a single, larger sub, and enjoy the benefits of response averaging by having two subs in different locations in the room. With dual subwoofers, deep bass is smoother and more detailed, minimizing the peaks and dips that often result with a single subwoofer setup. Denon was the first A/V manufacturer to embrace Audyssey's advanced DSP audio processing, and the AVR-S710W features the Audyssey Bronze suite of powerful DSP features, including MultEQ room acoustic measurement and DSP correction. Via the supplied measuring microphone and mic stand, Audyssey MultEQ measures all the speakers in your home theater during setup, including the subwoofer, and then generates multiple high precision DSP room acoustic correction filters, which together provide smoothest and most natural tonal balance, regardless of the brand or model of the various speakers. 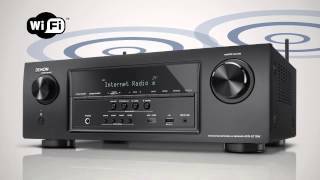 Denon's renowned HEOS whole home audio system features advanced multi-room, multi-source audio streaming, and the AVR-S710W features IP control capability with the HEOS Link, so you can control the receiver with the HEOS app. You can configure the AVR-S710W for a 7 channel home theater surround system, or you can choose to have a 5 channel surround system in the main room, with 2 of the amplifier channels dedicated to drive separate stereo speakers in another room. Enjoy a surround sound movie in one room, while others can enjoy stereo sound from a different source in a second room, at the same time. For maximum ease of setup, the AVR-S710W features a horizontal row of premium loudspeaker connection terminals, and the color coded connection system includes a set of color coded speaker cable labels that helps ensure correct speaker cable hookup the very first time. The AVR-S710W's front panel features 4 Quick Select function buttons, so you can quickly choose from the most popular sources, and the system remembers your preferred audio settings for each one. The ergonomic remote control also features dedicated Quick Select buttons for additional ease of use. Rated 5 out of 5 by DanofWoodstock from Best Home Theater System I purchased 2 of these to support home theater style systems in a new home. The features allow all the kids devices to interact with the system and you still have the quality sound expected from Denon. Rated 4 out of 5 by cbj4074 from Excellent for everything... except FLAC 5.1 stream Overall, this is an excellent unit, but it fails to do the one thing for which I purchased it: play FLAC audio files encoded in 5.1+ channels over-the-air. My disappointment is with the fact that this high-end receiver is incapable of playing FLAC audio files over DLNA when the file contains more than two audio channels. I bought this receiver specifically so that I could play high-resolution FLAC audio files, in 5.1+ channels, over the network. The product manual mentions support for FLAC files at extreme resolutions, but it doesn't mention any limitation with regard to the number of audio channels. I had the foresight to consult the manual before purchasing this unit and I was really disappointed to learn from the technician that FLAC audio files with more than two channels cannot be played-back over the DLNA interface and that I would instead be required to run a 30-foot HDMI cable under my floor (or connect a USB drive to the device, which is perhaps even less convenient for a library of this size and fluidity). I purchased this unit specifically so that I could leverage the wireless capabilities and avoid running a long cable from the PC to the receiver, or contend with the inconvenience of keeping a USB thumb-drive synchronized with the library on my PC. 5.1+ channel audio is becoming increasingly common, and many albums are being released on CD + BluRay. The 5.1 channel FLAC files in question were ripped from BluRay discs that I have purchased recently. The back of the BluRay jacket states that the audio is in 6-Channel DTS-HD Master format. As a programmer and an audiophile, I am as yet unconvinced that this is a hardware limitation. A Denon support technician confirmed to me that this capability is extremely unlikely to be addressed in a future firmware update. Final takeaway: this is a beautiful receiver, but steer clear if your intention is to play FLAC files with more than 2 channels, particularly over-the-air.